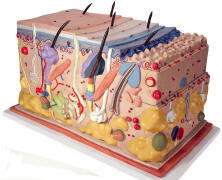 The skin covers the human body. Although we rarely think of it as such, it also an organ - the body's largest organ. It has a surface area of 2.4 square yards and weighs about 11 pounds. Its tough surface layer, the epidermis, continually replaces itself to repair wear and tear and keep out water, dust, germs and harmful ultraviolet rays from the sun. Under this a thicker layer, the dermis, is packed with nerves, blood vessel and stringy fibers of the body proteins, collagen and elastin. 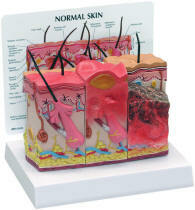 Our anatomical models of the skin fall into two broad areas - basic and advanced. 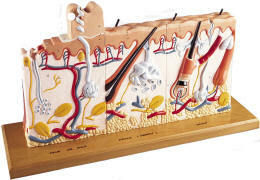 They are suitable for medical studies and are very helpful for patient education in dematology.